Unimpeded by any landmass, the mysterious Southern Ocean flows completely around Earth from west to east between the seasonally shifting icy continent of Antarctica and the coastlines and islands of Australia, New Zealand, South America and South Africa. 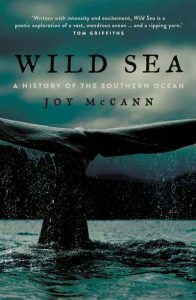 Weaving together sea captains’ journals, whalers’ log books, explorers’ letters, scientific research and ancient beliefs with her own voyage of discovery, Joy McCann reveals the secrets of a little-known ocean. A captivating exploration of the world’s biggest ocean and its inhabitants. The Pacific Ocean has been the focus of our fascination for as long as we have lived beside and on it. It covers one-third of Earth’s surface — greater than all of the planet’s landmasses combined. It contains half of the world’s water, hides its deepest places, and is home to some of the most dazzling creatures known to science. 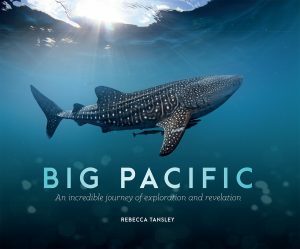 Big Pacific presents the Pacific Ocean and its inhabitants as you have never seen them before, blending a wealth of images with spellbinding storytelling to take you into a realm teeming with exotic life yet rarely witnessed up close — until now. The book is divided into four sections. The ‘Passionate Pacific’ looks at the private lives of sea creatures, with topics ranging from the mating behaviours of great white sharks to the monogamy of wolf eels, while ‘Voracious Pacific’ covers hunting and feeding. In ‘Mysterious Pacific,’ you will be introduced to the Pacific’s more extraordinary creatures, like the pufferfish and firefly squid, and explore some of the region’s eerier locales, like the turtle tombs of Borneo and the skull caves of Papua New Guinea. ‘Violent Pacific’ examines the effects of events like natural disasters on the development of the Pacific Ocean’s geography and the evolution of its marine life. Providing an unparalleled look at a diverse range of species, locations and natural phenomena, Big Pacific is truly an epic excursion to one of the world’s last great frontiers. 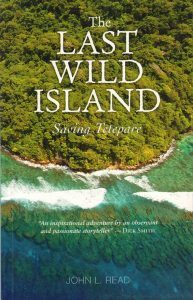 The last wild island: saving Tetepare. This is the story of Tetepare, the largest uninhabited island and one of the conservation gems of the South Pacific. This book tells the story of Australian ecologist John Read, his family and local residents as they battle to save Tetepare Island in the Solomons from ugly indiscriminate logging. This book covers, with both humour and insight, the ten year rollercoaster ride that is the dreams, fears and battles of the Tetepare tribe and their environmental volunteers.